Siemens VAI, a 100% subsidiary of Siemens AG Germany, said it is mulling a change in strategy to cater to the growing demand from the Indian and Chinese markets. To start with, it intends to invest about euro 35 million over the next two to three years in both the markets. The firm will set up and ramp up its existing manufacturing units in these countries for local production, engineering and project handling. 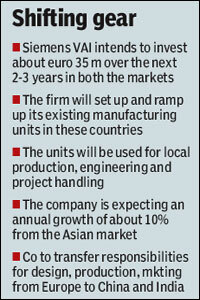 Siemens is expecting an annual growth of about 10% from Asia. Werner Auer president & chairman of the board of Siemens VAI said, After the slowdown, the competition in plant engineering has intensified significantly. In China and India, firms are building their own plants and want to produce steel from simpler and cheaper plants, while the developed markets like Europe, the US and Japan continue to focus on efficiency and flexibility of their production processes. The firm intends to develop plants specifically for this segment of the market and will also transfer the responsibility for design, production and marketing from Europe to China and India, Auer said. At the same time, the Chinese market is expected to see a surge in demand as the Chinese government intends to enforce replacement of outdated capacities with new ones. The firm will add about 500 engineers, project managers and shop floor people in these geographies. According to Siemens VAI general manager (casting and rolling) Tim Dawidowsky, China is the most price sensitive area where companies are looking at a 50% concession on the pricing. Local production will reduce the cost factor so that we can fit into their demands. At the same time, the firm intends to produce some of its major components only in its local manufacturing units rather than outsourcing it, Dawidowsky said. The move will help the company avoid loss of intellectual property.